Pemphigoid gestationis is a rare autoimmune blistering disease specific to pregnancy. It is characterized by pruritic, urticarial plaques with development of tense vesicles and bullae within the lesions. Recurrence with subsequent pregnancies are often more severe and may be associated with miscarriages, prematurity, low birth weight and rarely fetal death. We report this case of pemphigoid gestationis in view of the importance of early diagnosis and treatment for prevention of fetal risk. Pemphigoid gestationis (PG) is a rare autoimmune blistering disease presenting almost exclusively during pregnancy , though also associated with trophoblastic diseases . It is a rare disease with an incidence of 1 in 50,000 pregnancies. PG typically presents during the second or third trimester with recurrence in subsequent pregnancies. It can be diagnosed by histopathology and direct immunofluorescence which is confirmatory. Systemic steroids are the mainstay of treatment. A 25 year old normotensive, non-diabetic, euthyroid female, gravida 4, para 3, live children 2, with 24 weeks gestation presented with severly pruritic eruption on limbs and trunk of 3 weeks duration. The eruption started with severe pruritus over trunk and limbs followed two days later by raised reddish lesions bilaterally on trunk and both upper and lower limbs over a period of 2-3 days. Patient had similar but less severe eruption in the last trimester of her third pregnancy, one year back, and the baby died 3 days after a preterm vaginal delivery. The patient had not taken any treatment that time except for some topical preparations. She did not use oral contraceptives and did not report a flare with her menses. There was no significant family or drug history. Physical examination revealed bilaterally distributed erythematous papules and plaques with a few target lesions and multiple tense bullae and yellow crusted plaques on both forearms, diffuse vesicular plaques over whole trunk including neck and multiple erythematous papules on the thighs. Palms, soles and mucous membranes were not involved (Fig 1 & 2). Her haemogram, liver function tests, kidney function tests, TFT and abdominal ultrasonography was normal. Tzank smear showed few eosinophils. Skin biopsy results showed subepidermal vesicles and papillary dermal edema. Scattered lymphocytes, histiocytes and eosinophils were located in the dermis in a perivascular distribution (Fig 3). DIF results showed fulorescence along dermo-epidermal junction with anti C3. Fig 1: Papules and plaques with target lesions on abdomen. Fig 2: Tense bullae on forearm. Fig 3: H&E stain showing sub-epidermal vesicles containing scattered lymphocytes, histiocytes and eosinophils. The patient was treated by oral prednisolone 40 mg daily for 1 week and tapering 5mg every 5 days until a maintenance dosage of 20 mg daily was achieved. The patient was also given chlorpheniramine 25 mg thrice daily and topical mupirocin ointment for the crusted areas. The patient was on regular follow up and maintenance dose of 20 mg daily till she delivered and postpartum for 1 month. She delivered, vaginally at term, a healthy baby. Pemphigoid gestationis is a rare dermatosis that almost exclusively presents during pregnancy . It has also been associated with trophoblastic diseases such as hydatidiform mole or choriocarcinoma . The old term herpes gestationis was coined in recognition of the herpetiform lesions classically seen in PG  which shares clinical, histological and immunological characteristics with bullous pemphigoid . PG is a rare disease with an incidence of 1 in 50,000 to 60,000 pregnancies . PG is an autoimmune blistering disease with autoantibodies of IgG1 and IgG4 subclass targeting BP 180 antigen and activate complement via classical pathway . The PG antigen is located in the basement membrane of normal skin and in the basement membrane zone of amniotic epithelium of both the placenta and umbilical cord . There appears to be a genetic basis for the development of PG with HLA-DR3 and DR4. Recent immuno-histochemical studies have identified a T-cell population with a prevalent T helper (Th2) phenotype in the lesional skin of PG subjects, which may be implicated in the recognition of self antigens and production of pathogenic autoantibodies . In PG, there is a sub-epidermal bulla with an overlying inflammatory infiltrate consisting of histiocytes, lymphocytes and eosinophils in the dermis. DIF shows deposition of C3 in a linear pattern along the basement membrane and is considered pathognomic for diagnosis of PG . In 25% to 30% of cases, IgG deposition also can be found along basement membrane . Powell et al  demonstrated that a serological test measuring the major immunoreactive portion of the NC 16A domain of BP 180 antigen can be used to verify the diagnosis of PG and differentiate it from PUPPP. Intense pruritus is the consistent hallmark of PG, while the clinical course is variable. PG typically presents during the second or third trimester with a mean onset of 21 weeks but may develop in the first trimester, the time of delivery , the first postpartum month , and with the onset of menses or the use of oral contraceptives in the postpartum period . The clinical presentation of PG is polymorphic with patients initially presenting with erythematous papules, plaques or targetoid lesions followed by appearance of small vesicles and bullae on normal skin or on top of urticarial plaques. The PG lesions characteristically begin peri-umbilically and then spread outward to include the buttocks, trunk and extremities, sparing the mucous membranes, face, palms and soles . Patients with PG should be identified as a high-risk pregnancy and be followed accordingly. Fetal risks include miscarriages, prematurity, low birth weight and rarely fetal death. Five to 10% of neonates have a transient sub-epidermal blistering that resolves on its own with no sequelae . Systemic corticosteroids remain the mainstay of treatment in the low dosage of 20- 60mg daily but higher dosages up to 180 mg daily have been reported . Maintenance therapy, generally at a lower dosage, may be required throughout gestation and postpartum. Antipruritic drugs help to alleviate pruritus. Dapsone, sulfapyridine, gold, cyclosporine, methotrexate, cyclophosphamide, azathioprine, pyridoxine, IV immunoglobulins and plasmapheresis have been tried with variable results. In conclusion, PG is an autoimmune disease occurring almost exclusively during pregnancy. Its clinical course is variable but eruptions typically respond to steroid therapy. It is important to diagnose and treat PG early, not only to provide symptomatic relief to patients but to avoid fetal risks. 1. Engineer L, Bhol K, Ahmad AR. Pemphigoid gestationis: a review. AM J Obstet Gynecol 2000; 183: 483- 491. 2. Tillman WG. Herpes gestationis with hydatidiform mole and chorion epithelioma. Br Med J 1950; 1: 1471. 3. Shornick JK. Herpes gestationis. J Am Acad Dermatol 1987; 17: 539-556. 4. Borradori L, saurat JH. Specific dermatoses of pregnancy. Towards a comprehensive view. Arch Dermatol 1994; 130: 778-780. 5. Holmes RC, Black MM, Dann J, James DC, Bhogal B. A comprehensive study of toxic erythema of pregnancy and herpes gestationis. Br J Dermatol 1982; 106: 499-510. 6. Shornick JD. Dermatoses of pregnancy. Semin Cutan Med Surg 1998; 17: 172-181. 8. Fabbri P, Caproni M, Berti S, Bianchi B, Amato L, De Pita O, et al. The role of T lymphocytes and cytokines in the pathogenesis of pemphigoid gestationis. Br J Dermatol 2003; 148: 1141-8. 9. Kelley SE, Cerio R, Bhogal BS, Black MM. The distribution of IgG subclass in pemphigoid gestationis: PG factor is an IgG1 autoantibody. J Invest Dermatol 1989; 92: 695-698. 10. Powell AM, Sakuma-Oyama Y, Oyama N, Albert S, Bhogal B, Kaneko F, et al. Usefulness of BP 180 NC16A enzyme -linked immunosorbent assay in the serodiagnosis of pemphigoid gestationis (HG) and differentiating between pemphigoid gestationis and pruritic urticarial papules and plaques of pregnancy. Arch Dermatol 2005; 141: 705-710. 11. Jenkins RE, Hern S, Black MM. Clinical features and management of 87 patients with pemphigoid gestationis. Clin Exp Dermatol 1999; 24: 255-259. 12. Holmes RC, Black MM, Jurecka W, Dann J, James DC, Timulin D, et al. Clues to aetiology and pathogenesis of herpes gestationis. Br J Dermatol 1983; 109: 131-139. 13. Shornick JK, Bangert JL, Freeman RG, Gilliam JN. 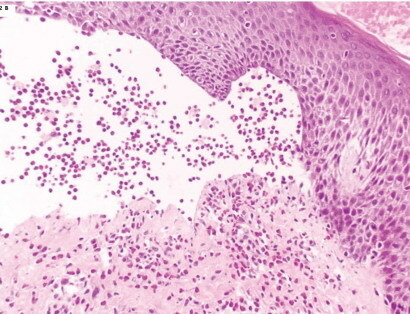 Herpes gestationis: clinical and histological features of 28 cases. J Am Acad Dermatol 1983; 8: 214-224. 14. Shornick JK, Black MM. Fetal risks in Herpes gestationis. J Am Acad Dermatol 1992; 26: 63-8.